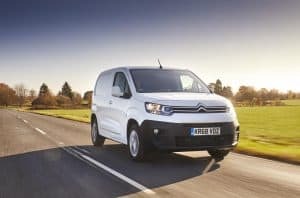 Van hire specialist Europcar has announced the addition of more than 100 Citroen New Berlingo Van models to its UK fleet. The operator will soon take on 100 standard Berlingo van models in full Enterprise trim, as well as a number of Berlingo Electric vans in the months ahead. It is a move designed to prepare the fleet for the introduction of London’s new Ultra Low Emission Zone next month. “Features in the New Berlingo Van, such as air-con and cruise control, can make driving a much more pleasant experience,” commented Stuart Russell, director of commercial vehicles at Europcar Mobility Group UK. In addition, the models feature a speed limiter, automatic electronic parking brake, one-touch electric windows, heated and electrically-operated folding door mirrors, front fog lights with cornering function and tyre pressure monitoring as standard. They also feature a folding passenger bench seat (with pivoting writing table) and a load-through bulkhead. However, Mr Russell went on to state the aspect of the new Berlingo that will potentially be of most benefit to users is the addition of a rear parking sensor. The Berlingo was recently named the 2019 International Van of the Year at the IAA Hanover CV Show. It also picked up the Light Commercial Vehicle of the Year and Light Van of the Year titles at the 2019 What Van? Awards.